The golden age of mechanical music machines really came in the late 19th century and early 20th century with player pianos and orchestrions. A player piano is defined as any actual acoustic piano that is played by a pneumatic or electro-mechanical mechanism that operates the piano action via pre-programmed music. Between 1910 and 1930 player pianos were the largest segment of the music industry in the United States. These instruments were mostly used for playing back preprogrammed music via piano rolls. Remember back then there was no radio, TV or movies. If you wanted to hear music you either had to play it yourself or have it played for you by an automated music machine. 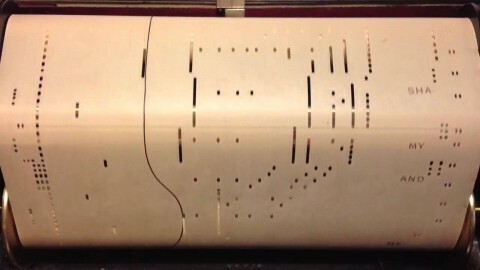 A piano roll is a continuous roll of paper with perforations (holes) punched into it that represent note control data. As the holes move over a 'tracker bar' each musical note is triggered when a perforation crosses the bar and is read. Notice the words on right side of the role (read from bottom to top.Player pianos were actually the very first Karaoke machines, another function they have in common with MIDI (link to MIDI Karaoke)! 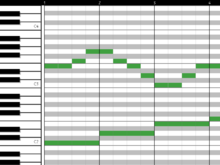 This layout should look familiar to anyone who has a DAW.The piano roll view of MIDI notes is a direct descendant of these 100 year old piano rolls because MIDI does digitally exactly what a player piano does mechanically. A new full-scale roll format, playing all 88 notes, was agreed at an industry conference in Buffalo in 1908, the so-called Buffalo Convention. Any player made anywhere in the world could now play any make of roll. Understanding the need for compatibility was the defining moment of the player industry. The consensus was key to avoiding a costly format war, which plagued almost every other form of entertainment media that followed roll music. That is except for MIDI! 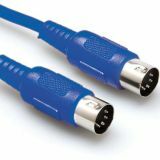 The whole point of MIDI is to allow different manufacturers to work together and it's the only media technology that is still widely used from 1983. In Germany the first reproducing player piano called the "Mignon" was developed by Weltein 1904. A reproducing player piano can play back a recorded performance with all the subtleties of dynamics and timing exactly as the original pianist played the piece. When World War I came in 1914, German patents were seized in the US, and Ampico (the American Piano Company) and the Duo-Art systems became the big players. Because these rolls could capture the subtle nuances of the performers (just like MIDI) in the rolls themselves, famous performers and composers including Gustav Mahler, Camille Saint-Saëns, Edvard Grieg, Claude Debussy, Scott Joplin, Sergei Rachmaninoff, Jelly Roll Morton and George Gershwin, all recorded piano roll performances. Most player pianos are now more than 100 years old the paper piano rolls are difficult to maintain and are deteriorating quickly.So there are companies that retro fit these classic 100-year-old pianos with MIDI interfaces.